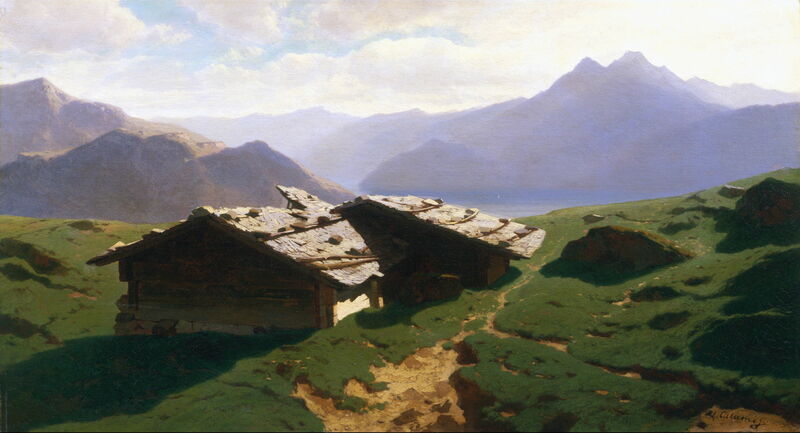 Alexandre Calame (1810–1864), Chalets at Rigi (1861), oil on canvas, 40.6 x 62.2 cm, Private collection. Wikimedia Commons. 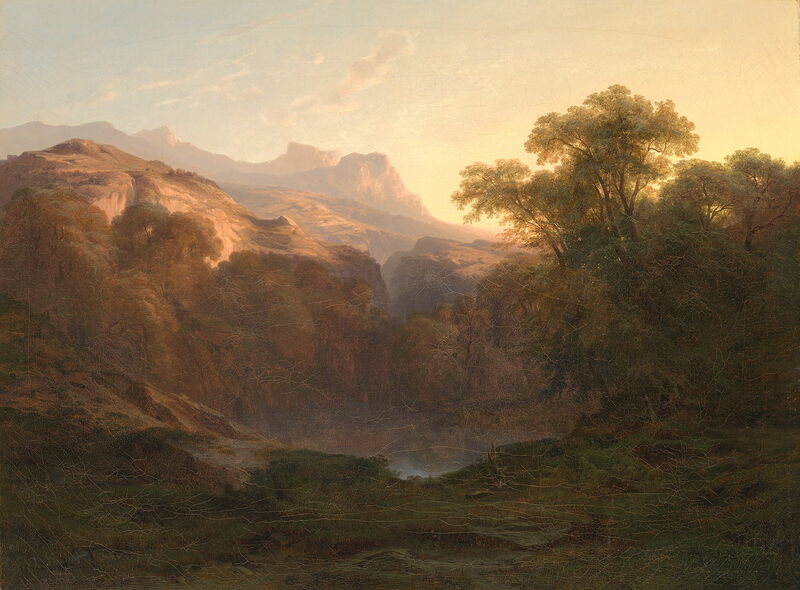 By the end of the 1840s, Alexandre Calame (1810–1864) had established himself as a major painter of dramatic, sometimes even melodramatic, views of the Swiss landscape, and had a steady stream of commissions to keep him busy, and comfortably off. He then focussed more closely on views of Lake Lucerne, often composed with quite formal elements, including a group of closer trees near the centre, with rugged cliffs and the lake in the middle distance, and high peaks beyond. 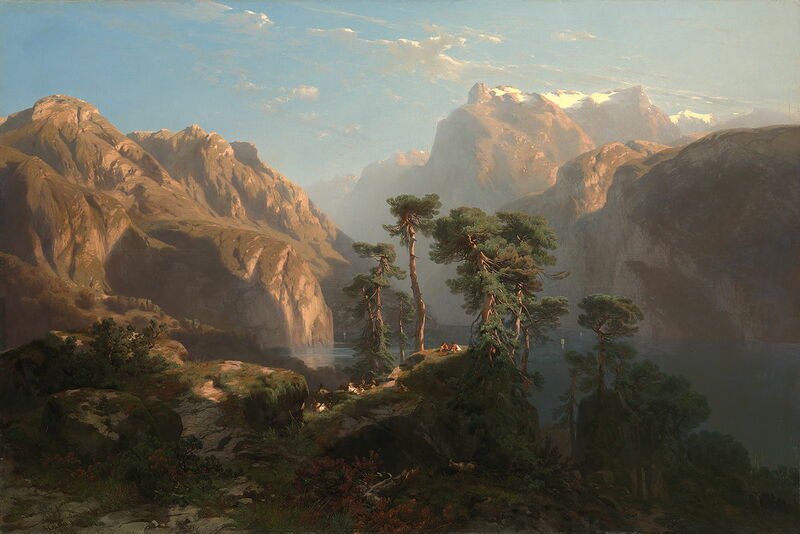 Alexandre Calame (1810–1864), The Lake of the Four Cantons (Lake Lucerne) (c 1850), oil on canvas, 142 × 111 cm, Muzeum Narodowe w Warszawie, Warsaw, Poland. Wikimedia Commons. The Lake of the Four Cantons from about 1850 is one of the finest of these formal compositions. The foreground trees and boulders add an air of gloom, and contrast with the warm sunlit patches of cliff and crag surrounding the vaguer, almost ethereal surface of the lake. The distance is then dominated by awe-inspiring rock pinnacles, as vertiginous as the imaginary spires seen in many fanciful Renaissance landscapes. 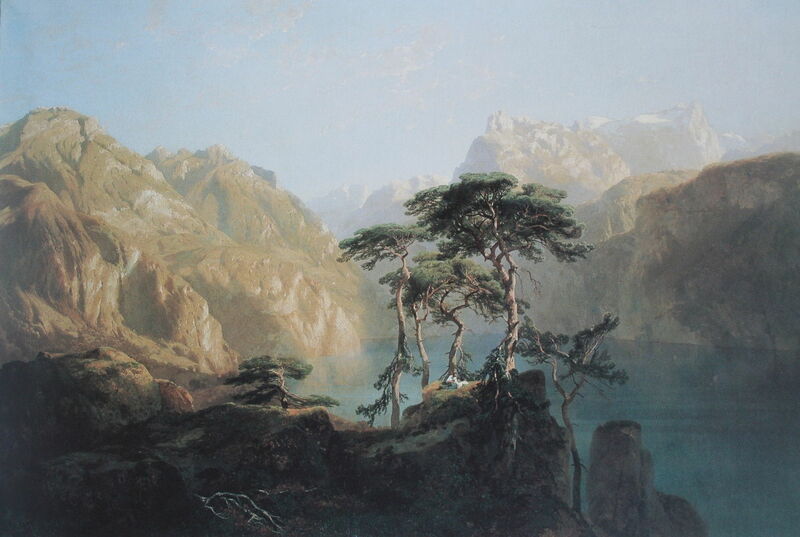 Alexandre Calame (1810–1864), Vierwaldstättersee (Lake Lucerne) (1851), oil, 107 x 160 cm, Musée d’art et d’histoire, Neuchâtel, Switzerland. Wikimedia Commons. Vierwaldstättersee (1851) shows the same stretch of Lake Lucerne, here from a greater elevation and with the sun higher in the sky, augmenting the distant passages in the haze. There are also some tiny figures, perhaps those of Calame’s customer, on the small grassy platform beneath the trees. Alexandre Calame (1810–1864), Souvenir of Handeck (1851), oil on canvas, private collection. Wikimedia Commons. Souvenir of Handeck (1851) is a pure studio composition based on sketches and memory of a scene near Handeck (Handegg), near what is now the Grimsel Pass south of Guttannen, in southern Switzerland. 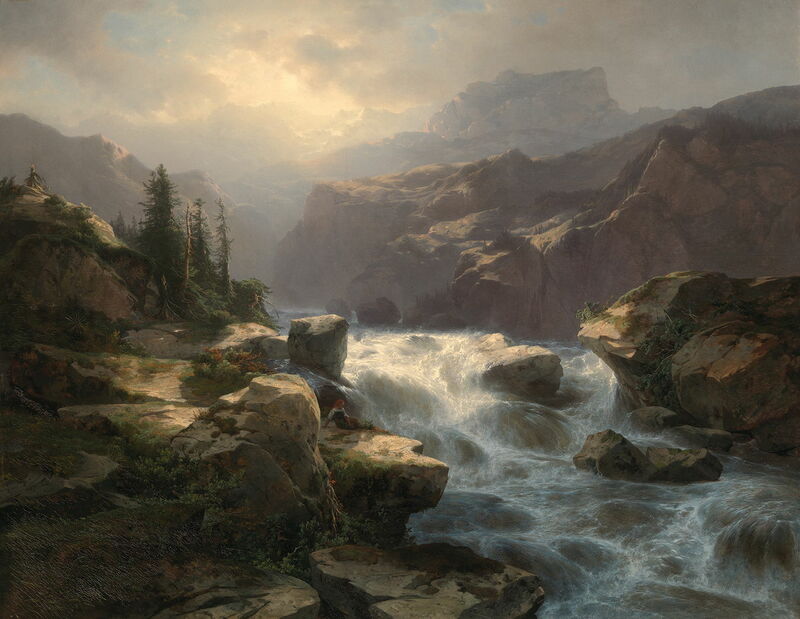 As in some of his earlier commissions, it combines high peaks, storms, and swollen rivers crashing down waterfalls – Calame’s ‘Swiss horror’. 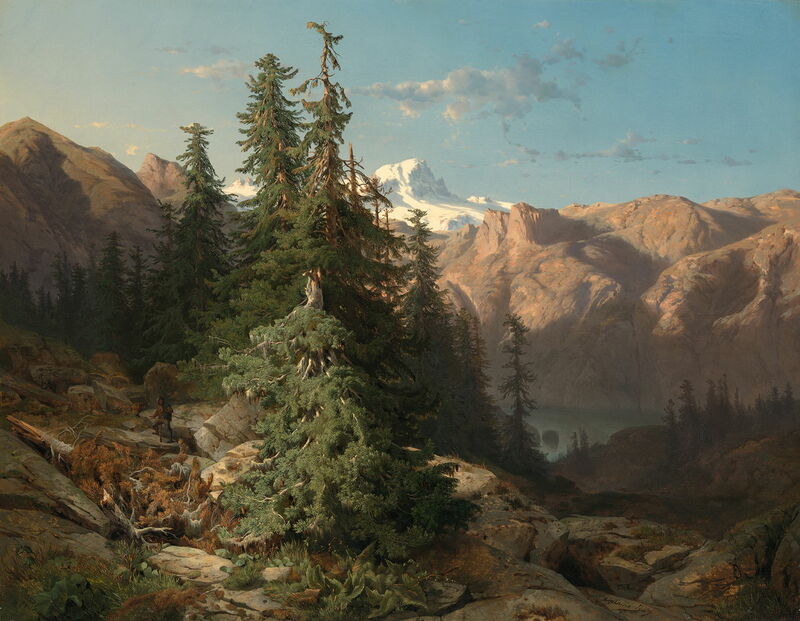 Alexandre Calame (1810–1864), The Jungfrau, Switzerland (1853-55), oil on canvas, 85.3 x 105.5 cm, Walters Art Museum, Baltimore, MD. Wikimedia Commons. 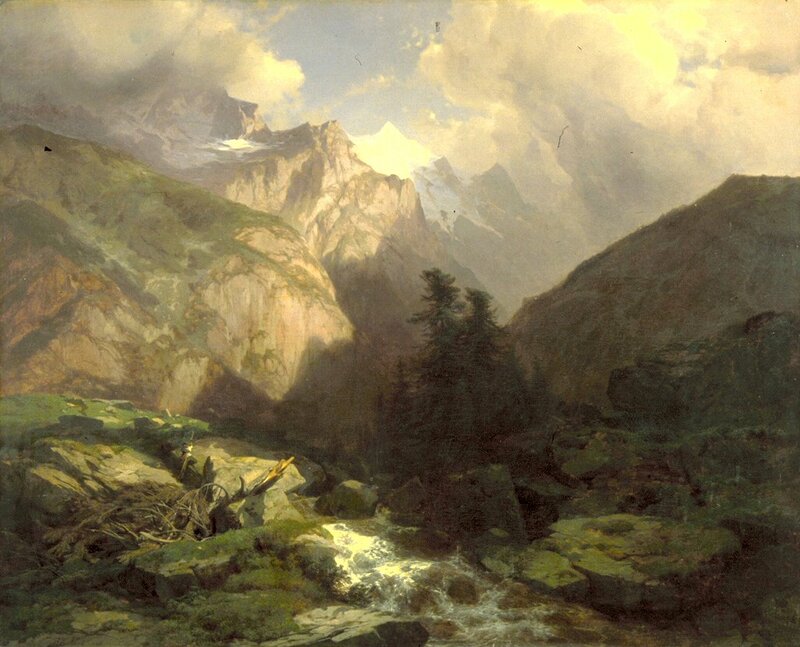 Calame also painted some of the well-known peaks, including The Jungfrau, Switzerland (1853-55). This 4,158 metre (13,642 feet) mountain in the Bernese Alps had only received its first ascent in 1811, and was still well off the beaten track. Calame views it from the bottom of the Lauterbrunnen Valley, another mountain torrent in full spate, with broken trees nearby to demonstrate the wildness of nature. 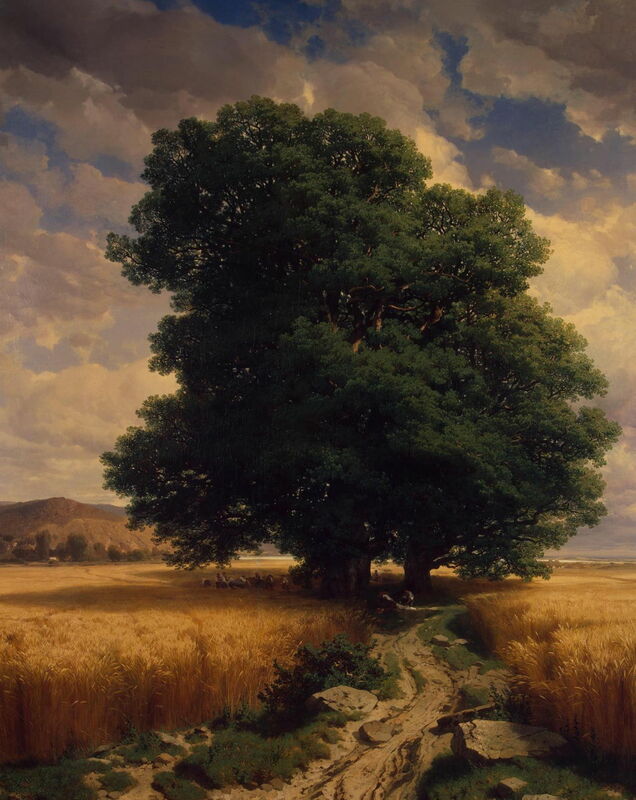 Alexandre Calame (1810–1864), The Sycamores (1854), oil on canvas, dimensions not known, Cincinnati Art Museum, Cincinnati, OH. Wikimedia Commons. 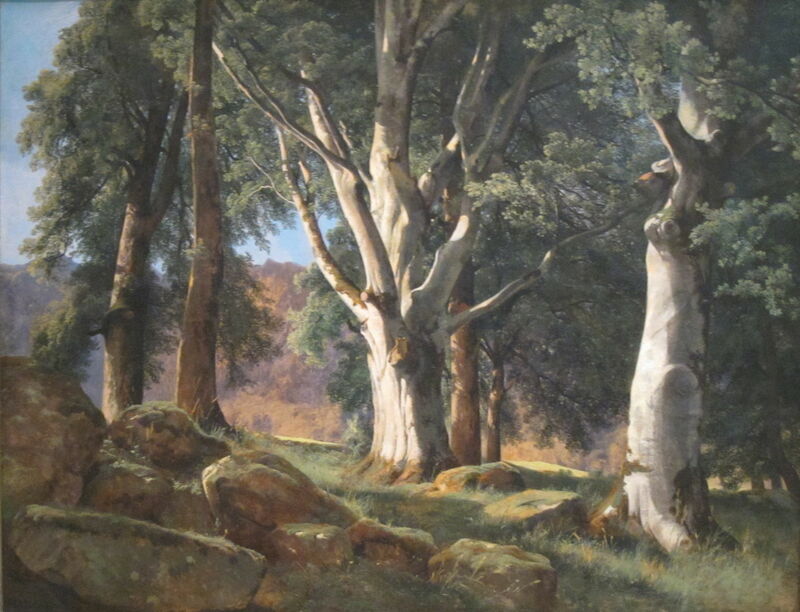 The Sycamores (1854) is one of several finished paintings which Calame made of stands of ancient trees that he came across during his travels in the Alps. 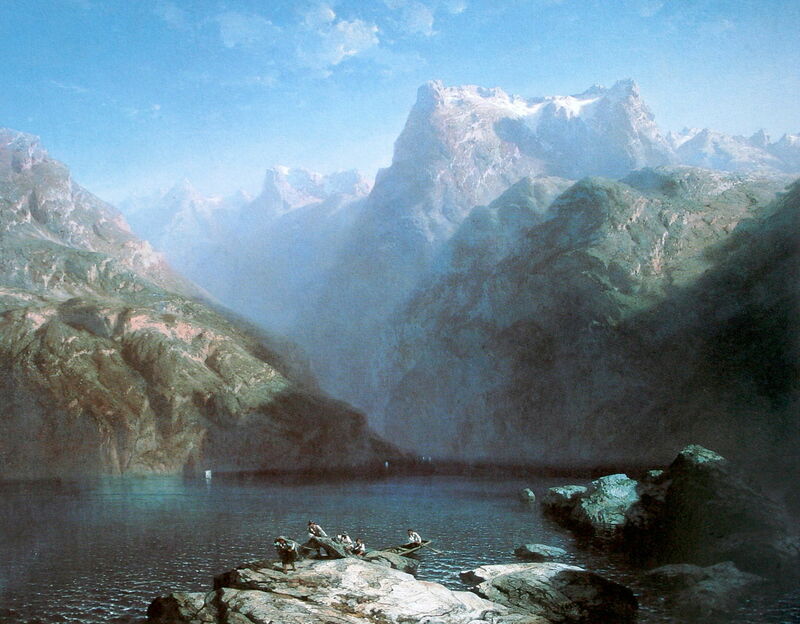 Alexandre Calame (1810–1864), Vierwaldstättersee (Symphony in Blue) (1855), oil, 179 x 244 cm, Private collection. Wikimedia Commons. Meanwhile back at Lake Lucerne, Calame went right down to the water’s edge for Vierwaldstättersee (Symphony in Blue) in 1855. Four sailing boats appear to be floating slightly above its water surface, and a team of boatmen are disembarking onto the massive boulders in the foreground. Gone are the trees too. Alexandre Calame (1810–1864), Landscape with Oaks (1859), oil on canvas, 173 x 140 cm, Hermitage Museum Государственный Эрмитаж, Saint Petersburg, Russia. Wikimedia Commons. Late in his career – now almost at the dawn of Impressionism – Calame developed some quite different motifs. Landscape with Oaks from 1859 shows a group of farmworkers during the harvest, perhaps returning to work after a short lunchbreak. Its sky with broken clouds is almost photographic in appearance, and adds great depth. Chalets at Rigi (1861) is even more modern in its stark and bold motif. The Rigi is a massif in central Switzerland which is surrounded by lakes – Lucerne, Zug, and Lauerz. Views across one of the lakes with the Rigi in the distance are prominent among the Alpine paintings of JMW Turner from twenty years earlier, but Turner seems not to have ascended the Rigi to paint from there. The last four paintings I show by Calame are undated, and two are more vague in their locations. Alexandre Calame (1810–1864), Mountain Landscape (date not known), media and dimensions not known, Amsterdam Museum, Amsterdam, The Netherlands. Wikimedia Commons. Mountain Landscape is a variation on the tree-cliffs-lake-mountain combination from an unknown location in Switzerland. 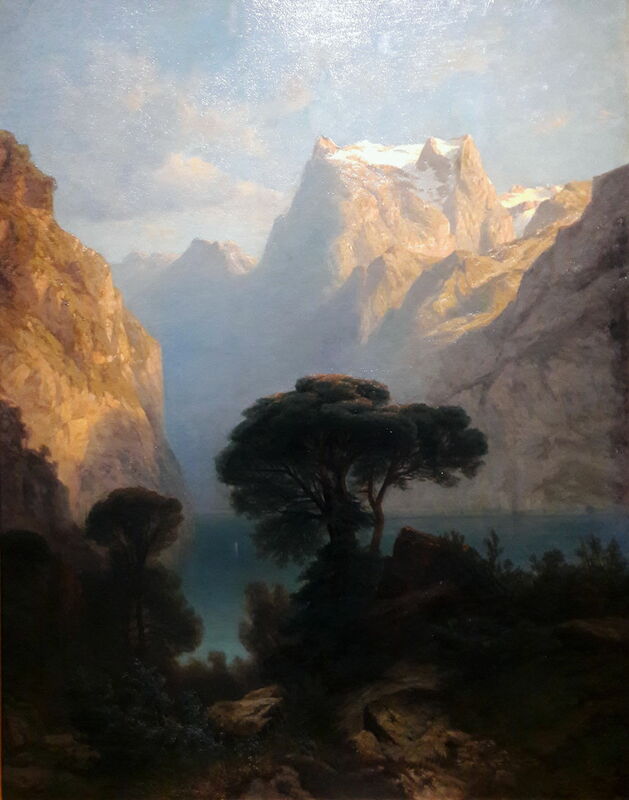 Alexandre Calame (1810–1864), In the Bernese Oberland (date not known), media and dimensions not known, Amsterdam Museum, Amsterdam, The Netherlands. Wikimedia Commons. In the Bernese Oberland remixes the same elements with a view of one of the higher peaks of the Bernese Alps. A lone figure is seen to the left of the broken pinetree in the foreground. Alexandre Calame (1810–1864), Vierwaldstättersee (date not known), media and dimensions not known, Amsterdam Museum, Amsterdam, The Netherlands. Wikimedia Commons. Vierwaldstättersee is another variation of his views of Lake Lucerne, including the same essential elements. Here a larger group of people are sitting on and around the same grassy platform as seen in Vierwaldstättersee (1851). Comparison with that earlier painting shows the consistency in Calame’s landscapes. 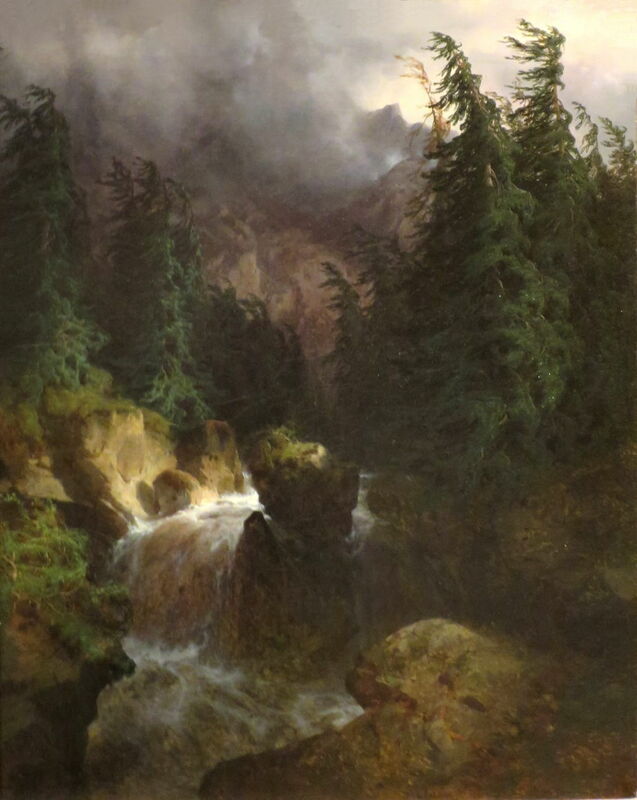 Alexandre Calame (1810–1864), Waterfall from Handeck toward Grimsel (date not known), media and dimensions not known, Amsterdam Museum, Amsterdam, The Netherlands. Wikimedia Commons. Finally, Waterfall from Handeck toward Grimsel is a ‘Swiss horror’ painted near the Grimsel pass, as shown in his 1851 Souvenir of Handeck. Calame had often suffered bouts of poor health, and in 1853 and 1860, he stayed in the south of France to try to recuperate. In 1864, he went there when suffering from a bad bout of pleurisy. He never recovered, and died there on 19 March 1864, at the young age of 53. Ferdinand Hodler’s early paintings were strongly inspired by Calame and Diday, as have many others who have aspired to paint the mountainous parts of the world. His influence lives on. Alberto de Andrés (2006) Alpine Views, Alexandre Calame and the Swiss Landscape, Yale UP. ISBN 978 0 300 12138 4. Posted in General, Life, Painting and tagged Calame, Corot, Diday, Hobbema, Hodler, landscape, painting, van Ruisdael. Bookmark the permalink. That little “chalets” painting seems the most artistic and interesting. The persistent pressure to “paint large” is a shame. Beautiful! I love the light in his paintings.